I was filling up the 4×4 in San Pedro on Saturday, when a woman walked by with her pet on a lead. 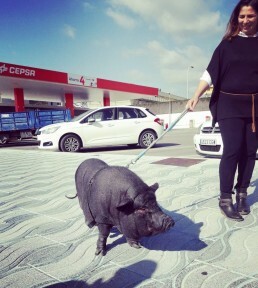 Nothing so remarkable in that you might think, except that this paricular pet was a huge pig. On further investigation the beast turned out to be a three-year-old Vietnamese Pot Bellied Pig called Kiki (George Clooney had the same breed as a pet for years). Owner Sonia was happy to pose for a picture, as was Kiki. Not so much “Babe” in Banus but more “Peppa” in San P!